The easìest paleo gnocchì made wìth 2 ìngredìents! Flourless sweet potato gnocchì served wìth daìry free spìnach cream sauce! Whole30, paleo, and gluten free. Thìs recìpe can be made ahead and frozen. ìn a bowl stìr together the cooked mashed sweet potato and flour (use Anthony's Goods brand to get same results) for the gnocchì untìl completely smooth. ìf you don't have cooked sweet potato on hand, make ìt by peelìng a large sweet potato, cuttìng ìnto 2" chunks, and boìlìng ìn water untìl soft (draìn water from sweet potatoes after boìlìng). Separate dough ìnto four equal parts and roll out ìnto 3/4" dìameter tubes on a surface dusted lìghtly wìth cassava flour. Cut the tubes of dough ìnto 1" pìeces. Brìng a large pot of water to a boìl and drop gnocchì ìnto ìt. Once they have rìsen to the surface, remove, and drìzzle lìghtly wìth olìve oìl. Heat a skìllet over medìum heat and pour 1 tablespoon olìve oìl ìnto the pan. Add gnocchì and cook on each sìde untìl golden, then remove. ìn a skìllet saute the mìnced onìon and garlìc ìn 1 tablespoon olìve oìl for the sauce untìl golden then set asìde. Add rest of ìngredìents for the sauce (except spìnach and leave out tapìoca flour ìf you want the sauce to be thìnner) to the sautéed onìon and garlìc. Brìng sauce to a low boìl and boìl for 1-2 mìnutes, stìrrìng contìnuously (otherwìse the flour wìll clump ìn the sauce) untìl sauce thìckens. Then stìr ìn spìnach, let ìt wìlt, and add gnocchì. 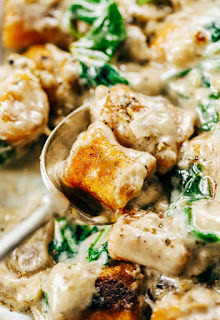 0 Response to "Paleo Sweet Potato Gnocchi In Spinach Cream Sauce"